So what was The Bill like last Wednesday? I didn't see it. I was in Seville. Actually I've never seen it, and the truth is that - from what I've heard - I would rather be at a reserve game on a wet night at Cliftonhill never mind the Uefa Cup final in one of Europe's most beautiful cities. But, in any case, those tuned to the telly weren't watching the channel with adverts. From the BBC viewing figures it's clear that even passionate followers of Glasgow Rangers were tuning in to the big game. You were found out lads. Ducking behind the couch hoping you're not spotted watching doesn't fool the audience research people. It was the biggest audience in the history of television in Scotland and whether you were sipping champagne in anticipation of a Celtic victory or enjoying a vintage port in prayer that your friends from Portugal would triumph, the message is clear. There is nothing quite like glory in Europe. Or even getting into touching distance of it. In the final analysis, Celtic had to satisfy themselves with wallowing in the millions that came rolling in instead of the glory. The board will have to content themselves with crying all the way to the bank. It was a great adventure while it lasted, that romp round Europe. Celtic swashbuckled their way from Suduva to Seville. And the bar owners from Blackburn to Boavista thanked them for it. In the end though, it was a step too far for Martin O'Neill's team who, in truth, had outrageously over-achieved in the competition and who, lest we forget, actually snatched glory from the jaws of ignominy. You will recall that they only floated into the tournament in the first place because of the parachute that rescued them from the Champions' League crash landing that was the failure to dazzle against Basel. Few though would hold that against them now. Sure, Celtic failed to win the cup and the uniqueness of the Lisbon Lions remains intact. But they did win friends and influence people and illustrated the awesome power that the world's greatest sport holds over people in this country. 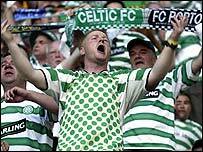 We will never know the official tally because you cannot hold a census of a wandering population, but those of us who were there would not argue with any guess of Seville's city limits embracing in excess of 60,000 Celtic fans. Is there another football club in the world that could command such a Pied Piper effect on its hypnotised support? But it is over now, and no cheap shots about the childish tactics of Porto, which did underline that the art of theatre is still alive and well , will uncurl the petted lips of the Celtic fans who still feel they were dealt an injustice. The writing was on the wall at the correct sending off of Bobo Balde and to ask them to recover from that was demanding a fairytale too far. At times in this European run I began to believe that Celtic were no longer living in the real world, but there was a sharp reminder in the Estadio Olimpico. So what happens next? How on earth would I know, this is Scottish football of which we talk here. Maybe one half of the Old Firm will win the Champions League, maybe they will be home from Europe before the Glasgow Fair holiday postcards. But Celtic have won Scotland a new respect for which we should be truly grateful. Few have suffered, except perhaps the producers of The Bill. It seems that few were watching after all. Is Larsson the best in Britain?